Every few months I find my brunette hair needs a little boost in colour. Though with years of hair dye, I felt that I needed to look into proper hair care for my colour treated hair. While all hair colours have their own needs, I thought I'd share my brunette hair care routine for all of you looking to make your colour last longer. I recently made the switch to using semi-permanent colorant, though to be honest I wouldn't have considered it if I realised I'd actually picked up the wrong box in Boots.. oops! We've all been there! It wasn't until then that I realised how much better it was for my hair and having it gradually wash out instead of seeing those roots coming through was well worth the switch. My first choice for Semi-Permanent colourant is Nice n Easy No Ammonia in Dark Brown. I like this one as it generally lasts for 24 washes whereas the non-permanent version in the range only lasts 8. The colour always turns out the way I want it to and they always include conditioners to prolong the colour. Once you're finished with the dying process, it's time to think about haircare. Aside from the odd colour prolong shampoo, I never really looked into what I should and shouldn't be using on coloured hair. However I've recently found the secret.. it's sulfate-free shampoo! The sulfates in normal shampoos can really strip your hair of your colour so the best way to prolong it is by going the sulfate-free route. Your hair will love you for it too! 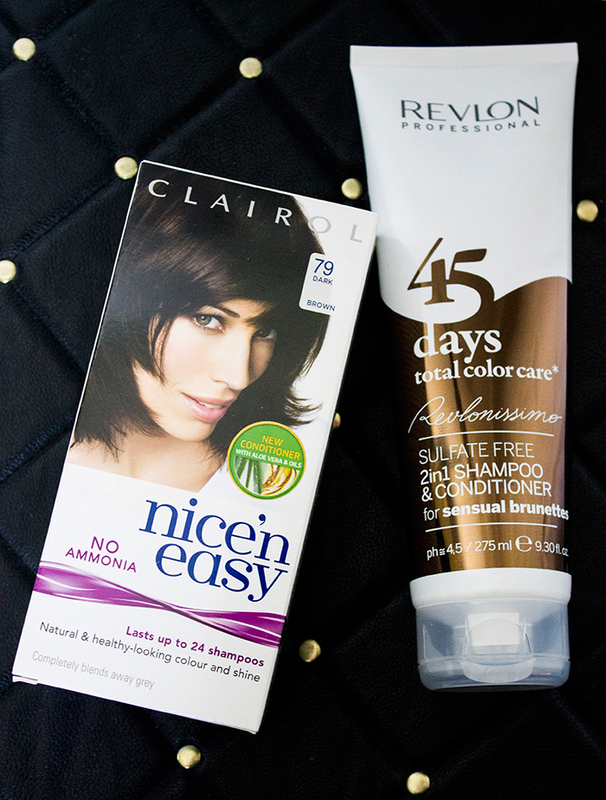 My choice right now would be the Revlon Revlonissimo 45 Days Total Colour Care which is a 2-in-1 shampoo and conditioner free from sulfates. They have a product to suit each hair colour so the Sensual Brunette one would be my pick for brunettes. I also find that as it's a 2-in-1, you'll need to wash your hair much less thus resulting in prolonged colour. I'd love to know what you all use to dye your hair or the ways you try to prolong your hair colour, feel free to leave your comments below!